Two coronal mass ejections are heading for Earth from the sun. A solar flare record flare from 2003. Two coronal mass ejections—eruptions from the sun that send a cloud of charged particles into space—are hurtling toward Earth right now. As they enter the Earth’s magnetic field, they could create magnetic storms that interfere with radio transmissions, GPS, and even power grids. But scientists from the National Oceanic and Atmospheric Administration say the risk is low. This time. On Monday night, a minor solar flare gave off a first magnetic cloud. Then on Wednesday afternoon, a major flare from the same sunspot region gave off a bigger CME. 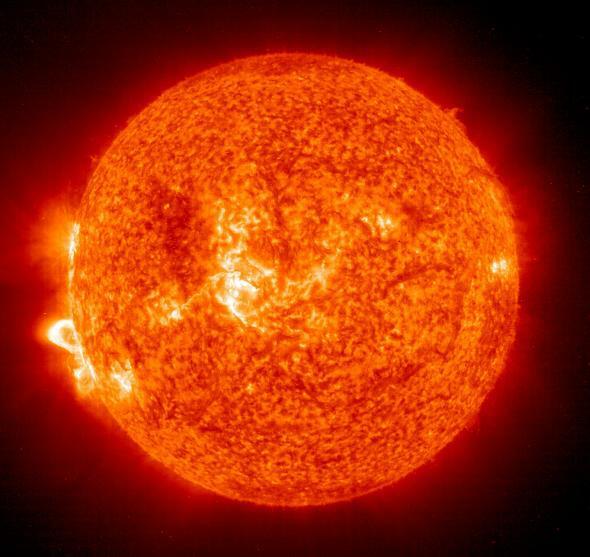 Thomas Berger, the director of the Space Weather Prediction Center at NOAA, said that both are aimed at the Earth. The first burst is forecast to hit Earth sometime Thursday night, and the second should arrive around midday on Friday. NOAA uses observation of the sun and mathematical modeling to predict when magnetic storms will hit. And about an hour or so before the storms hit, they pass NASA’s ACE satellite, which is upstream from Earth and therefore encounters CMEs first. At that point, NOAA can obtain specific measurements about attributes like the direction of the cloud’s magnetic field, which plays a role in how intense the magnetic storms are when the CMEs interact with the Earth’s magnetic field.